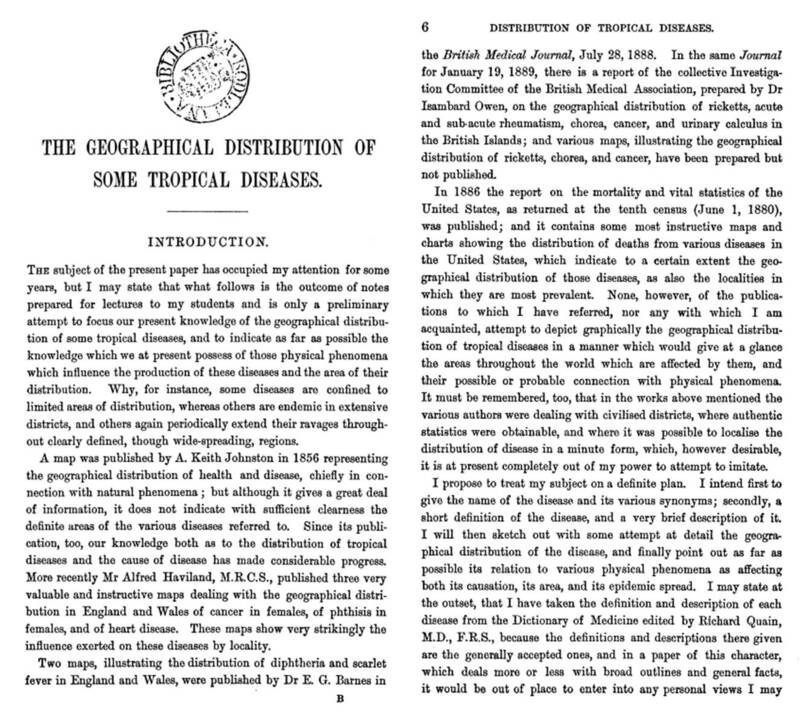 On the geographical distribution of some tropical diseases. 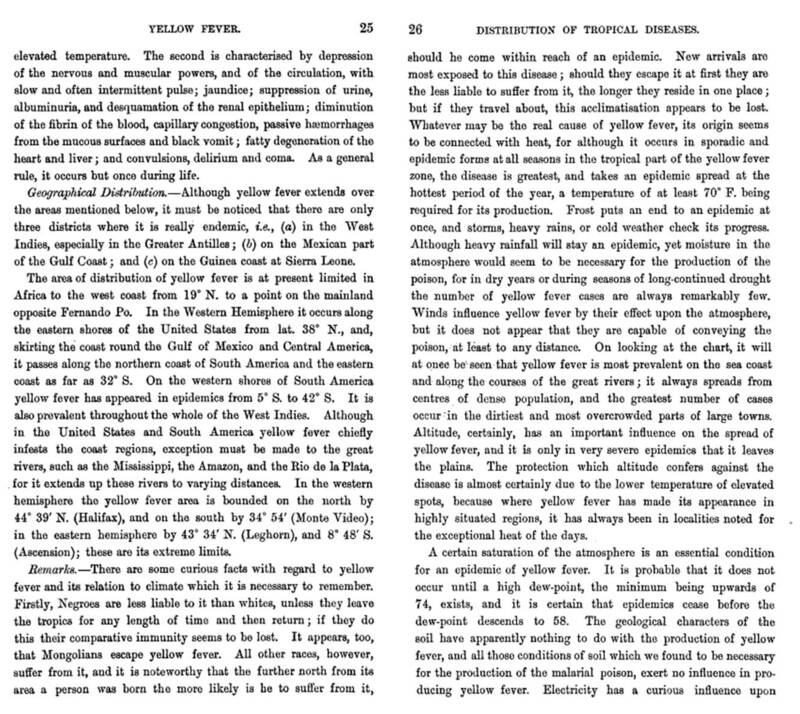 Robert William Felkin, 1889 (54 pp). 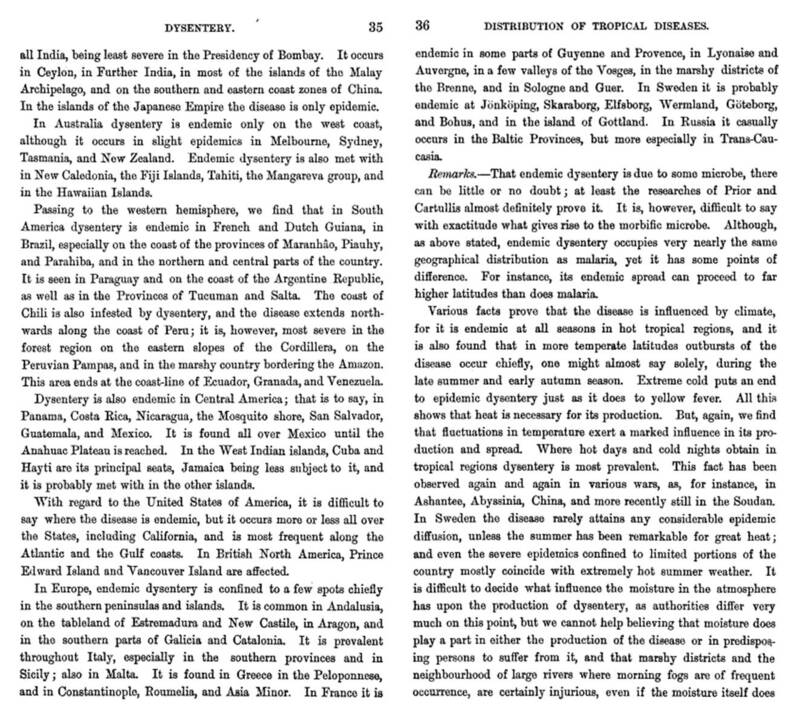 Note: Google has done the world a favor by producing Google Books. 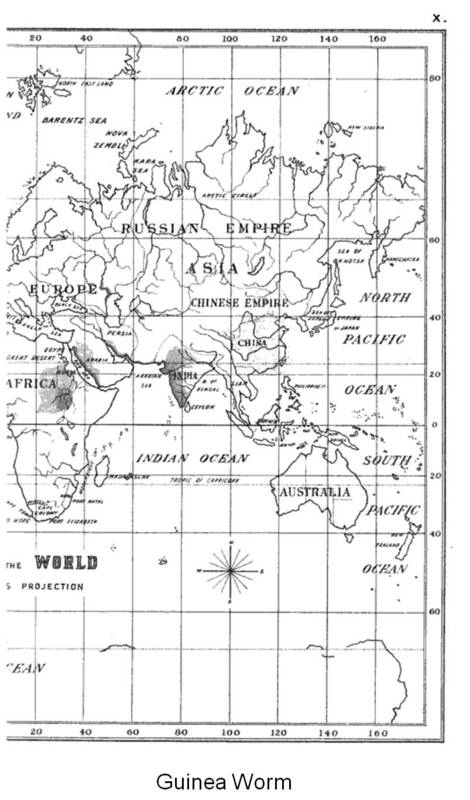 But unfortunately, the libraries scanning these books lack an understanding of the value of large (>1 page) figures such as maps, so some of the most important information in these books is lost. 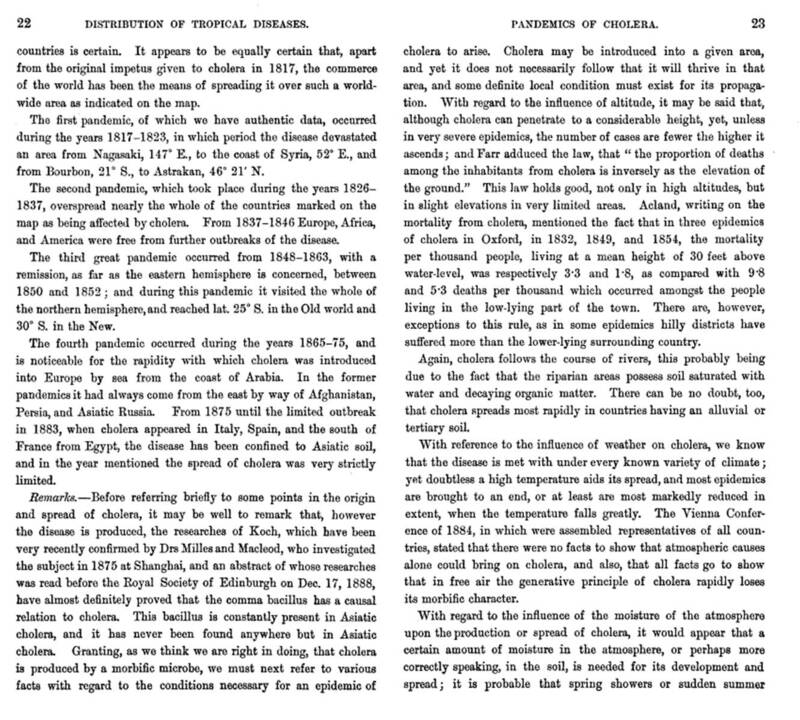 Such a lack of inclusion may be hardware (scanner) related, but is not the case for Archives.org books, telling me there are other reasons for these behaviors ($, time, laziness). 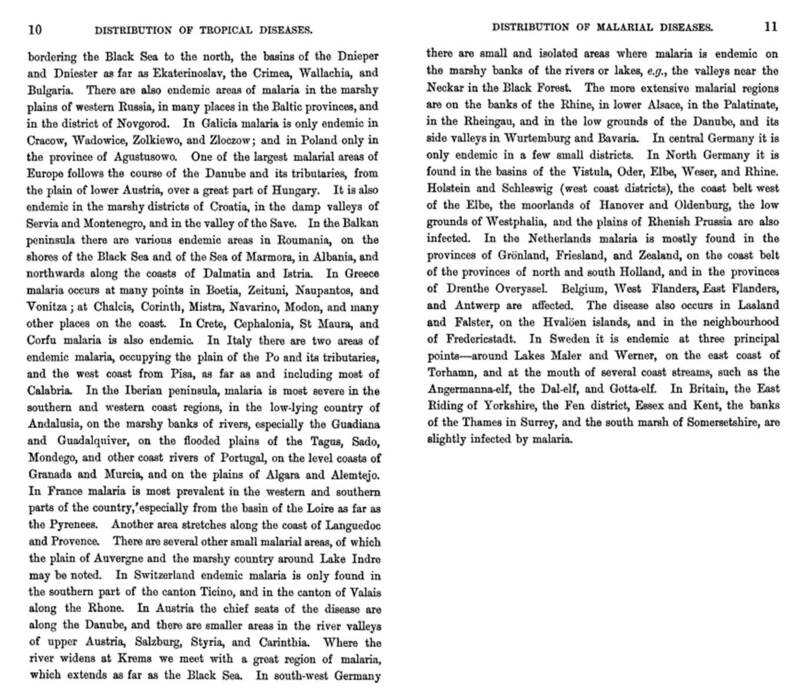 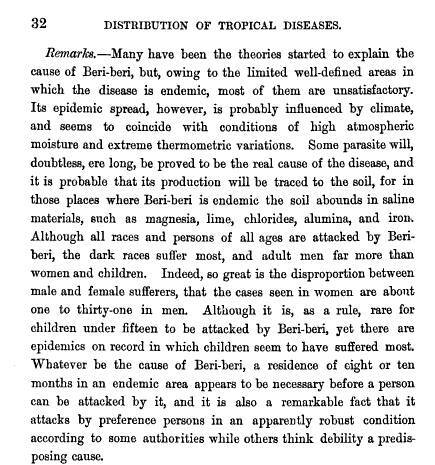 Dr. E. G. Barnes, British Islands, maps on diphtheria and scarlet fever, BMJ, July 28, 1888. 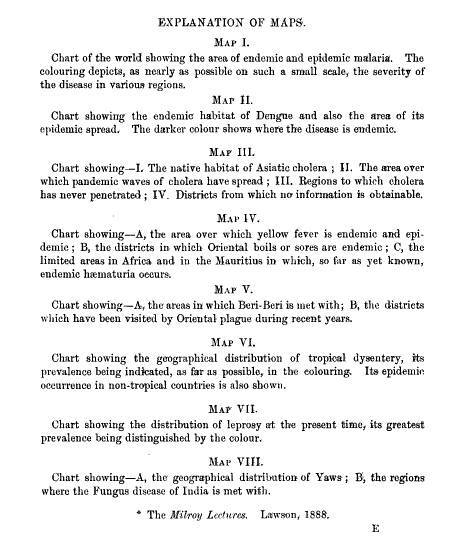 Dr. Isambard Owen, British Islands, Rickets, Rheumatism, Chorea, Cancer and Urinary Calculi discussed, with Rickets, Chorea and Cancer mapped, January 19, 1889. 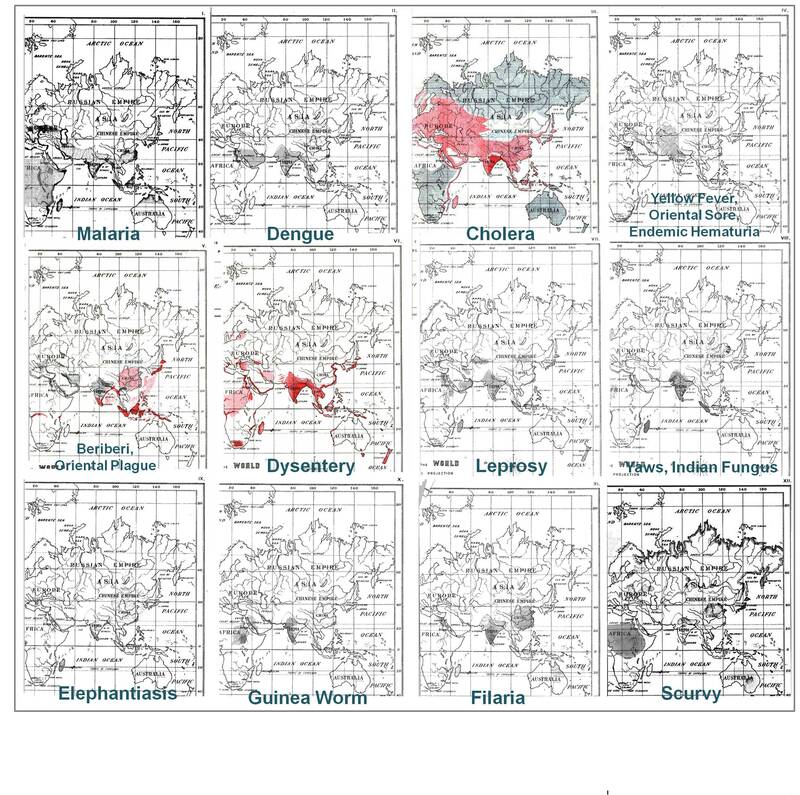 1880 US Census maps and charts on disease. 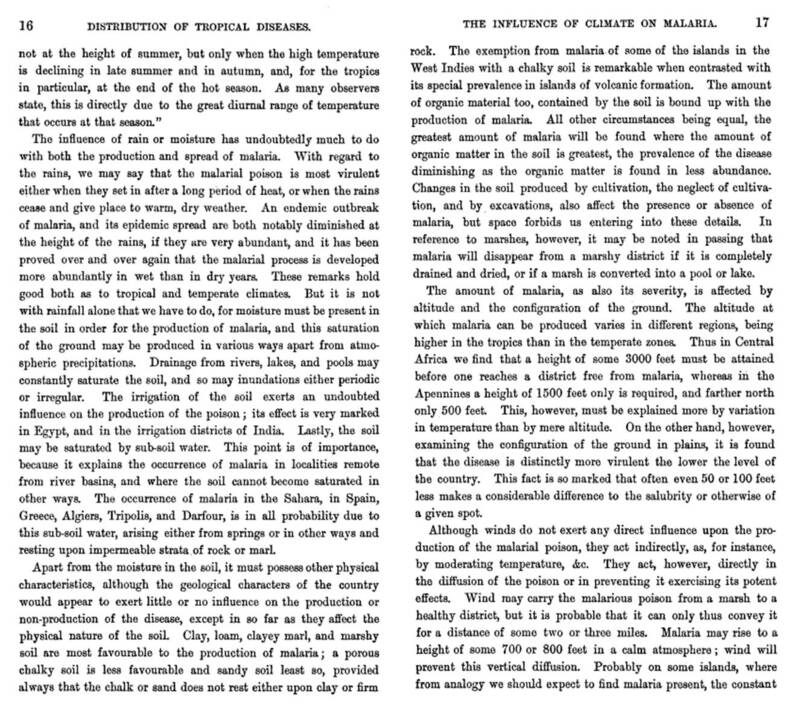 Published June 1, 1886. 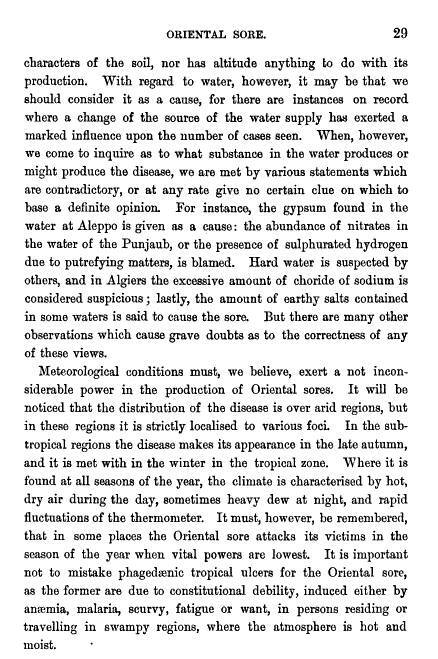 Dr. August Hirsch. 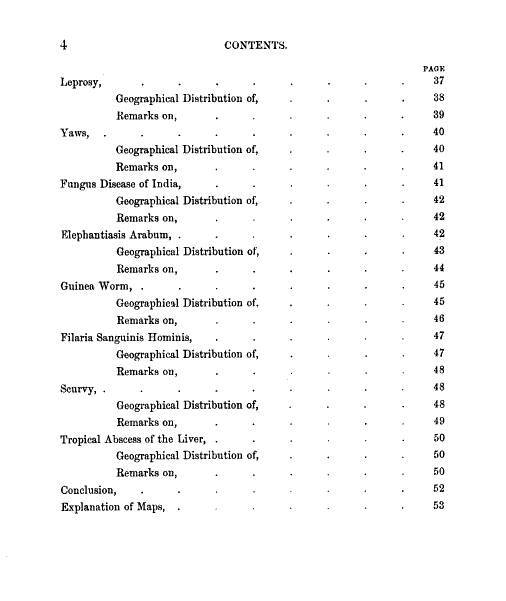 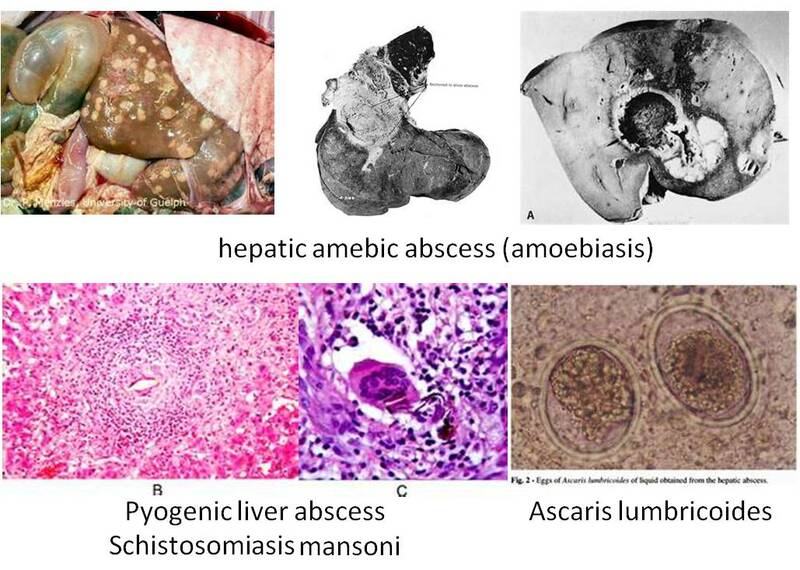 Handbook of Geographical and Historical Pathology. 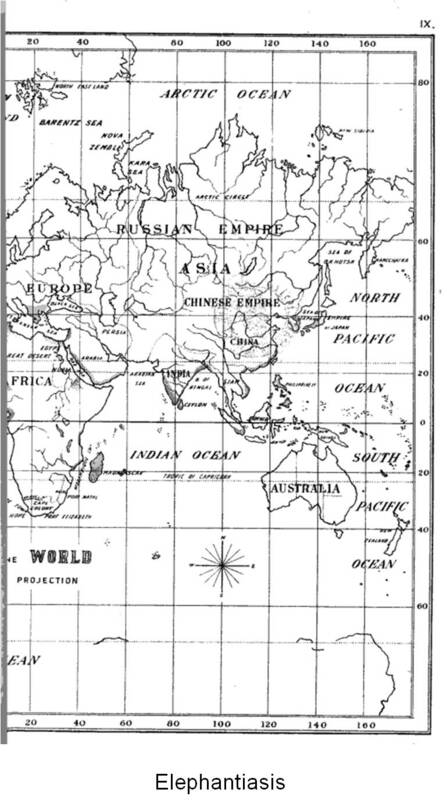 (an immense multivolume set, but with no maps; consequently these maps were later produced and published by the British Society in its Proceedings). 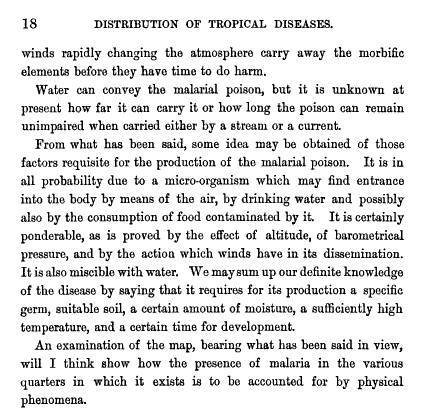 Also mentioned are Richard Quain’s Dictionary of Medicine and Elias Loomis’s Contributions to meteorology 1889 writings. 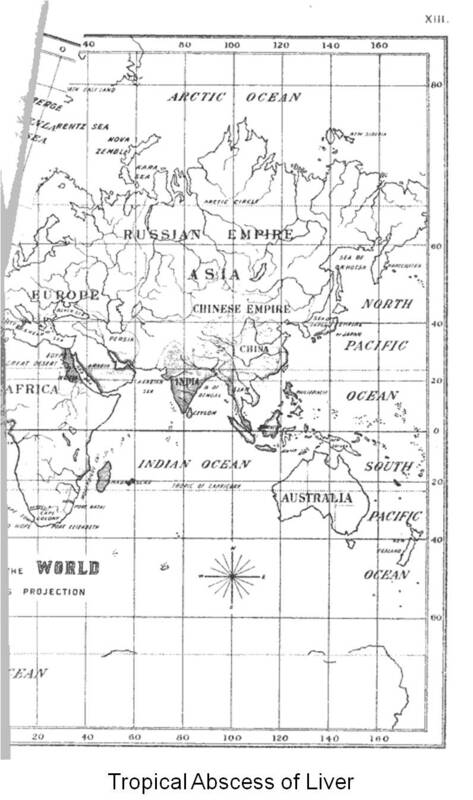 Map number 16 is the most important map to review. 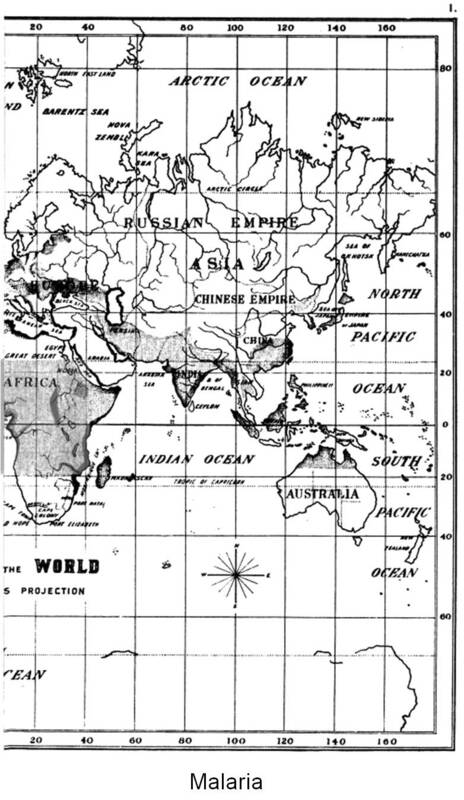 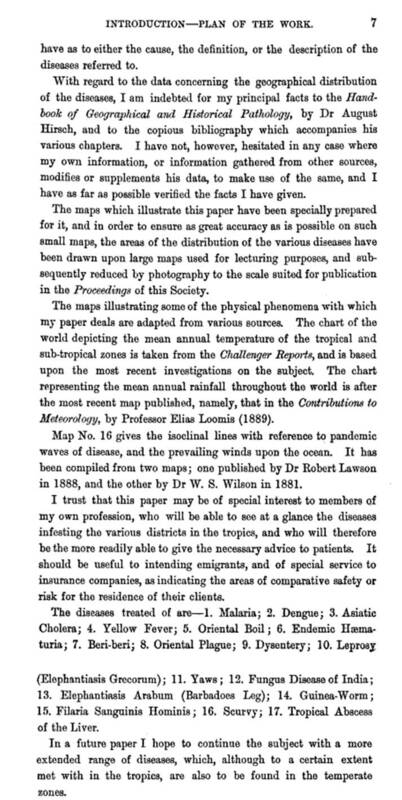 This map merged the information produced by Dr. W. S. Wilson in 1881 and Dr. Robert Lawson in 1888. 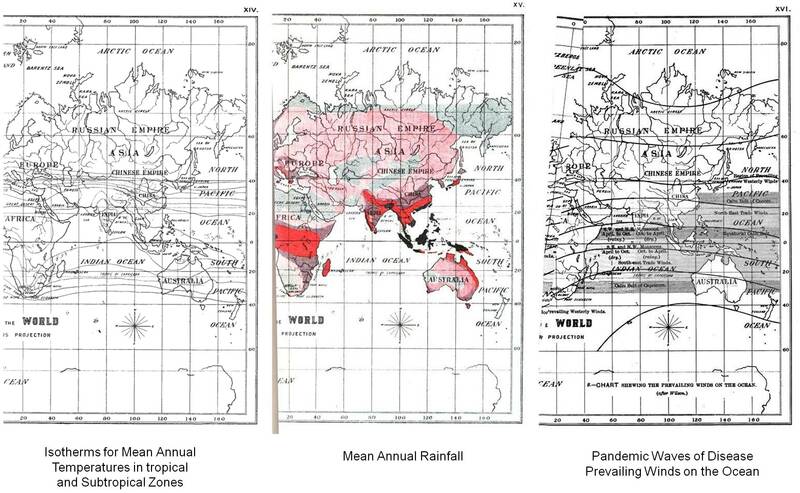 This map merges the concepts of pandemic disease spread direction and guidance with prevailing winds patterns and latitudinal limits on the diffusion process. 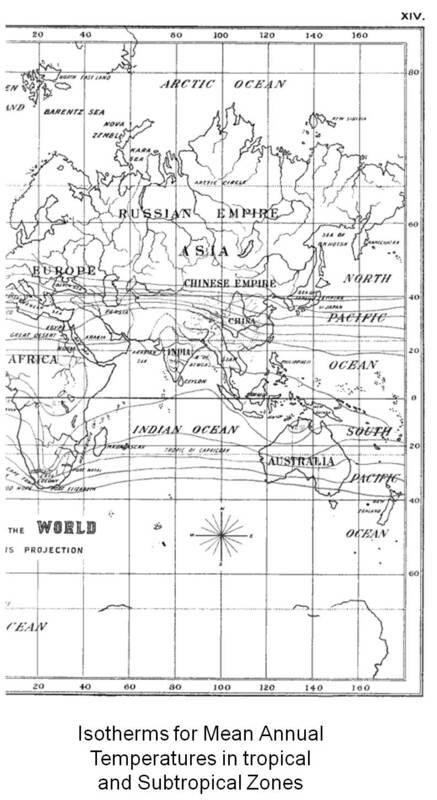 Map notes: Notice the latitude boundary defined for distributions in Australia and Africa. 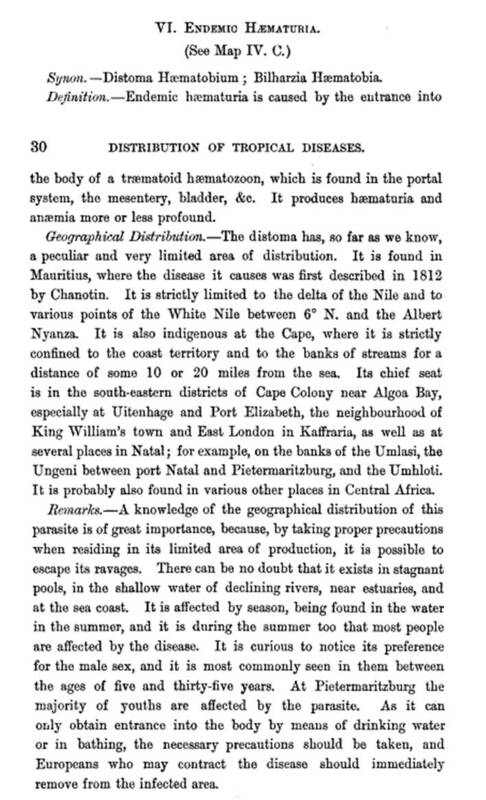 The endemic region is clearly defined by the north and south boundaries depicted in Africa. 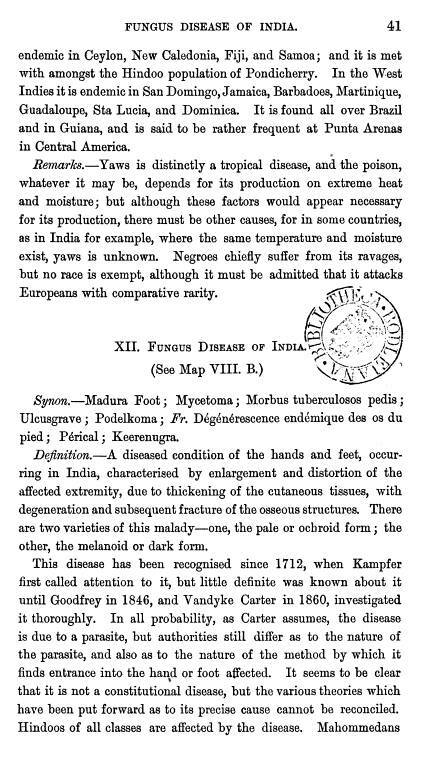 Some endemicity might exist on the Eurasian contienent as well in and around parts of Lower India, but the distribution further north into Europe is evidence for the definition of an epidemical disease region. 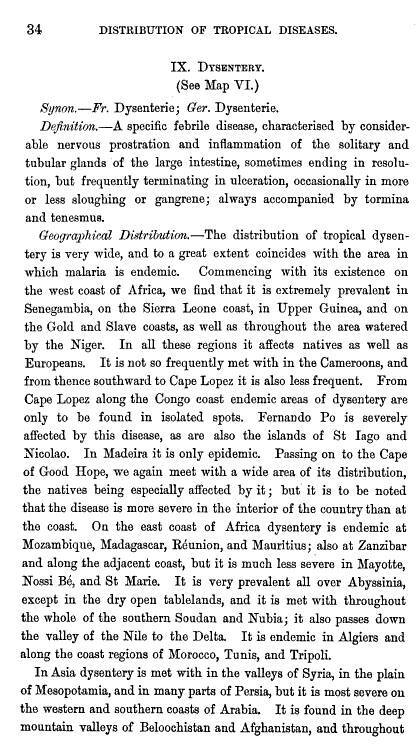 For the most part, the epidemical region depicts disease behaviors within the coastal shipping port settings (dark erareas), with diffusion then continuing inland. 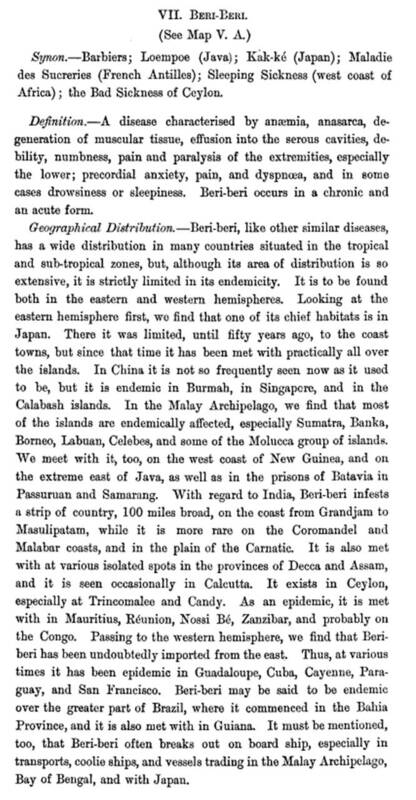 Notes: The Regionalization of Malaria Zones (with race and ethnicity inferences) is provided by the above section of this book. 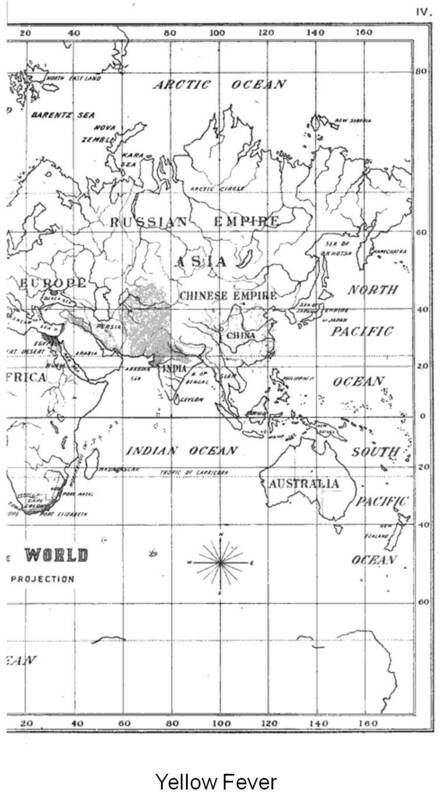 Note: reasons for fuzziness of region over and around China? 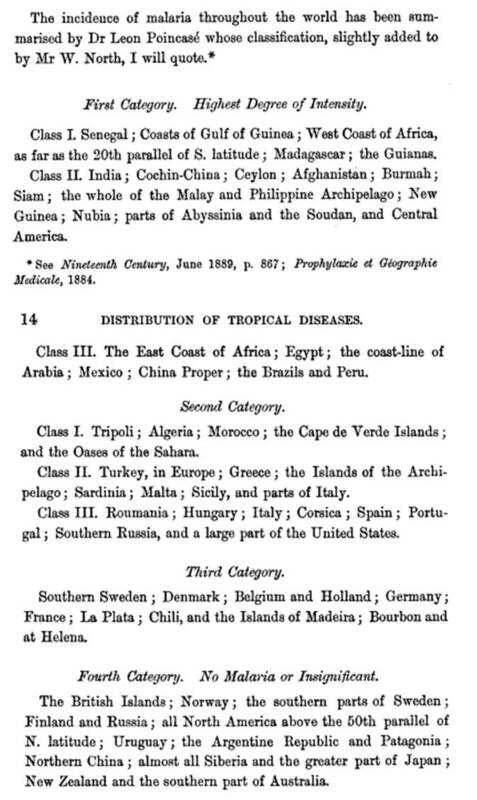 is it included, but not well documented? 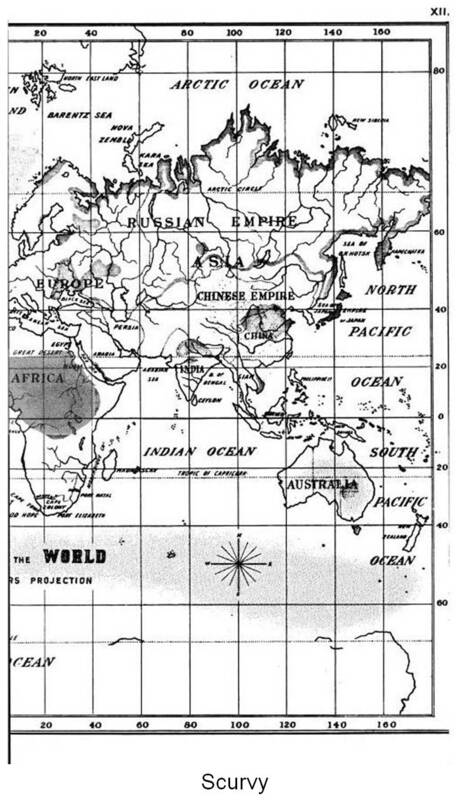 Notice also the distributions depicted along the northern coast of Africa on the Mediterranean and along the Nile River. 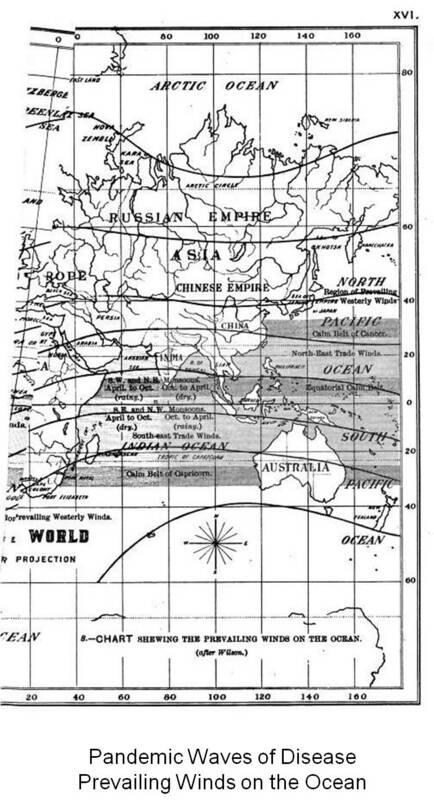 Notes: The above map probably depicts the epidemics period as ca. 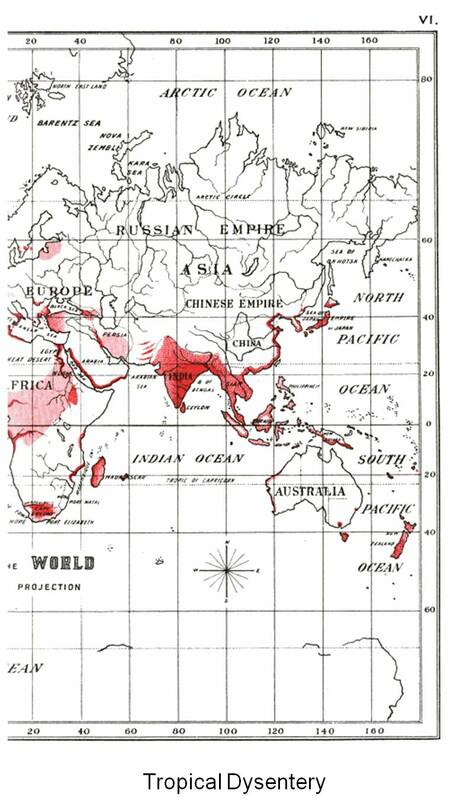 1817-1821 (dark red), ca. 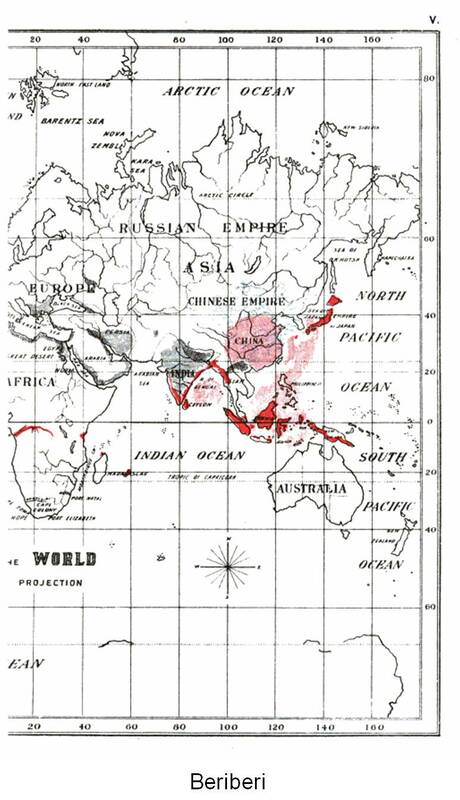 1829-34 (red), and ca. 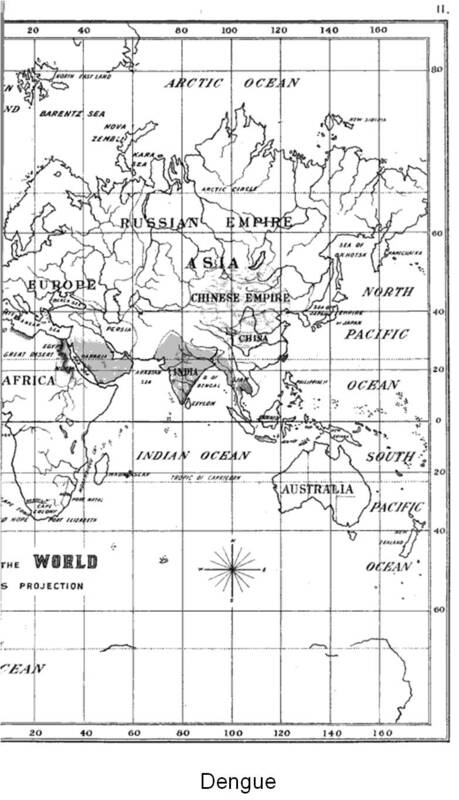 1848-53, and possibly later (dark grey). 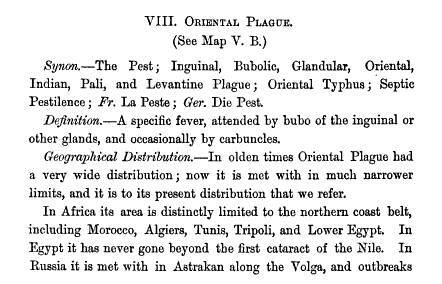 These also demonstrate nidal (place of origin) and endemic patterns, versus global migration, pandemic diffusion patterns. 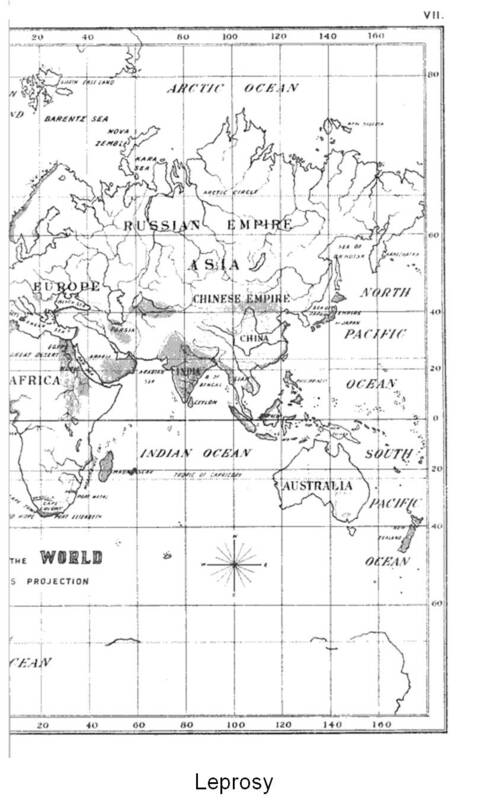 The diffusion of the diseaes across most of the continents in the grey area is very much an exaggeration. 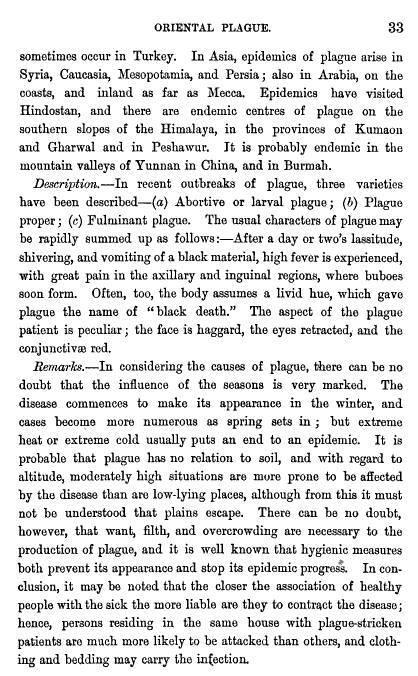 The white disease-free regions are based on mountain topography and don’t take human population distribution into account. 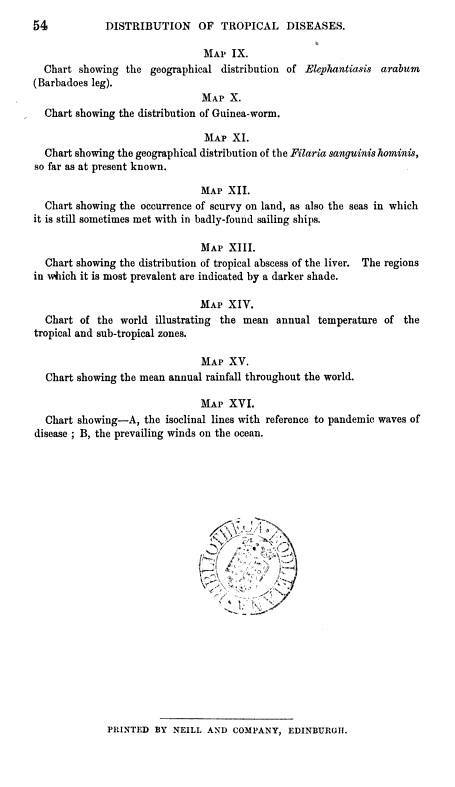 William Farr’s elevation theory is mentioned on p. 23. 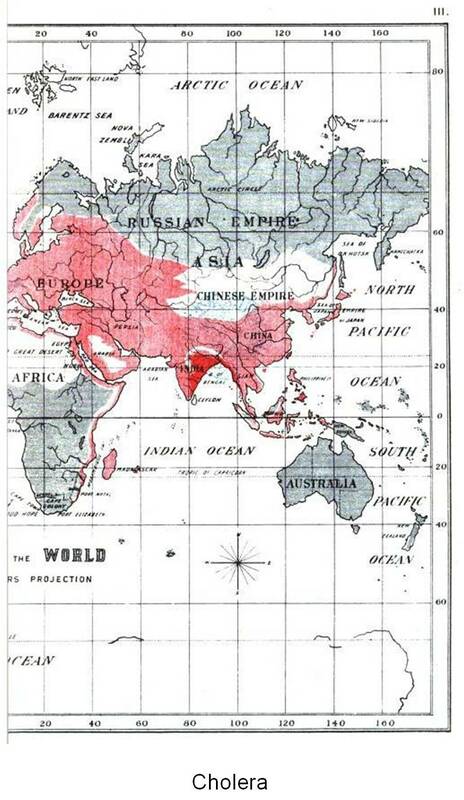 (The map that follows depicts Yellow Fever, Oriental Boil (leishmaniasis) and Endemic Hematuria (Bilharzia). 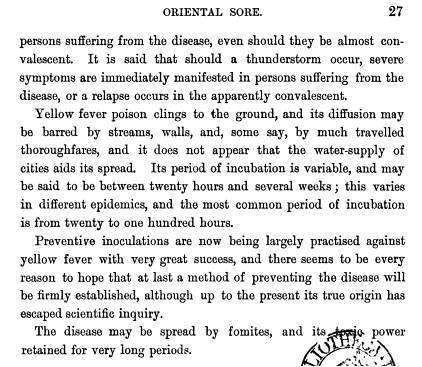 Notes: Primarily oriental sore and hematuria are mapped above. 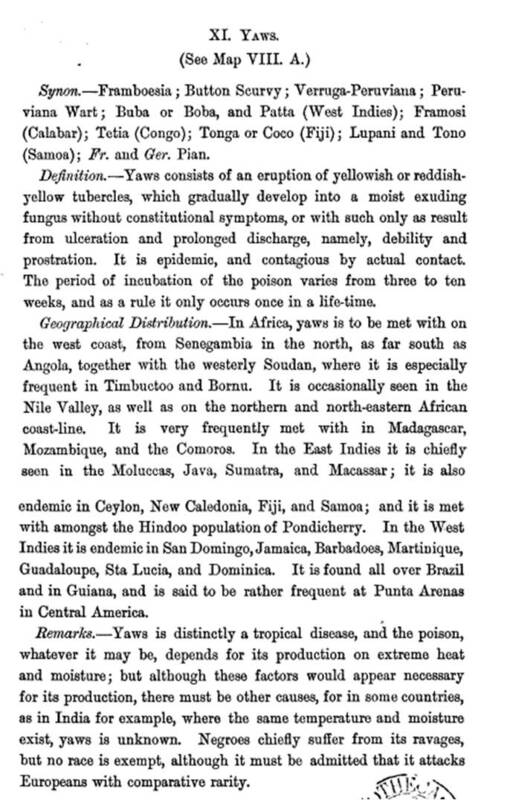 Yellow fever was restricted to the western hemisphere (see text below, p. 25). 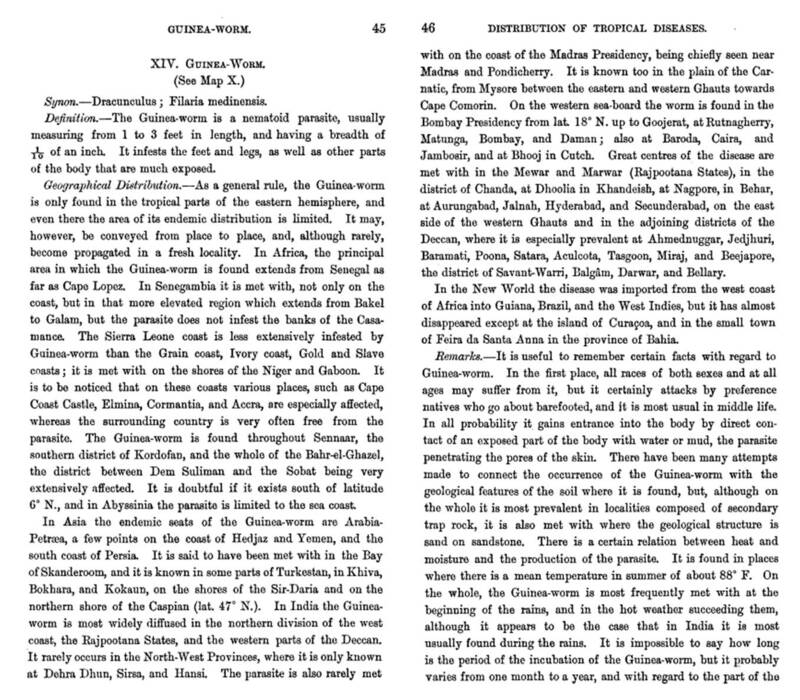 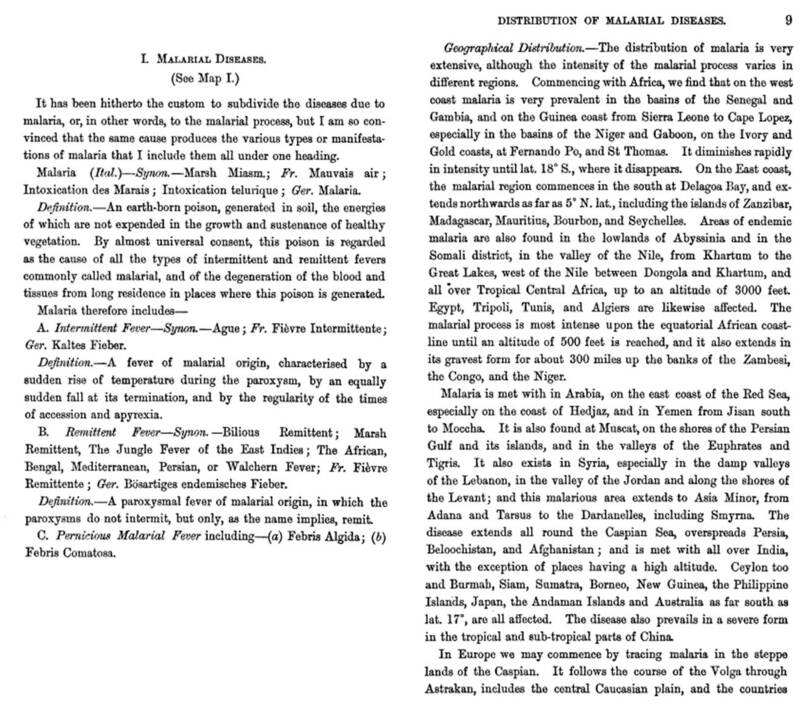 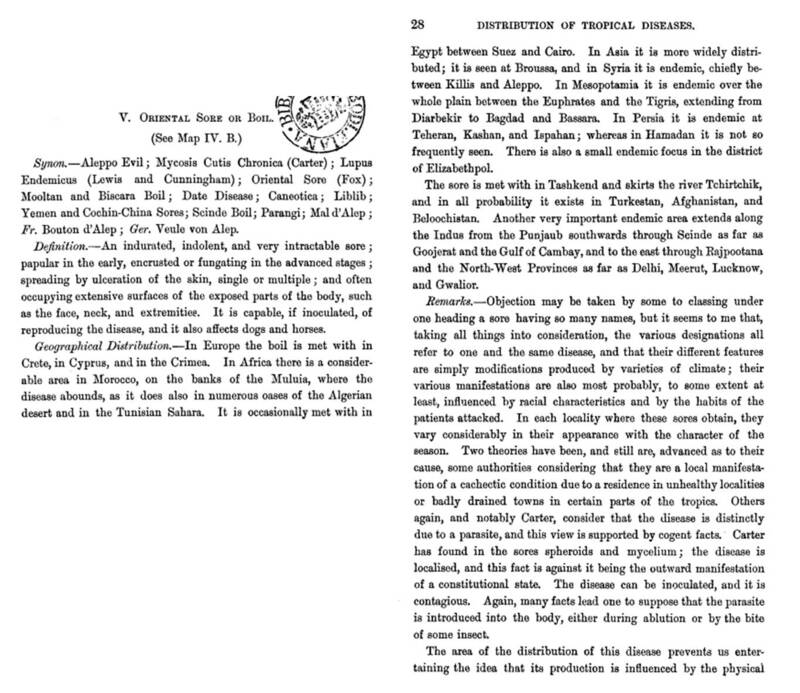 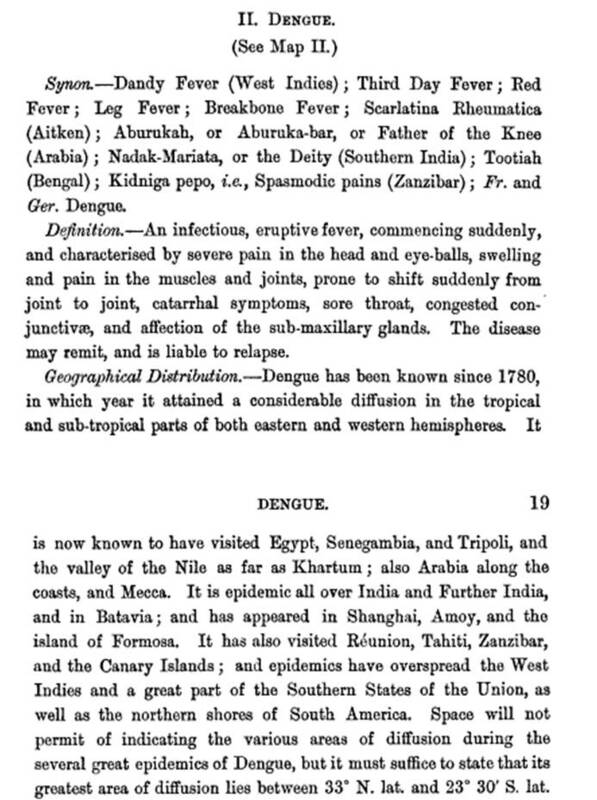 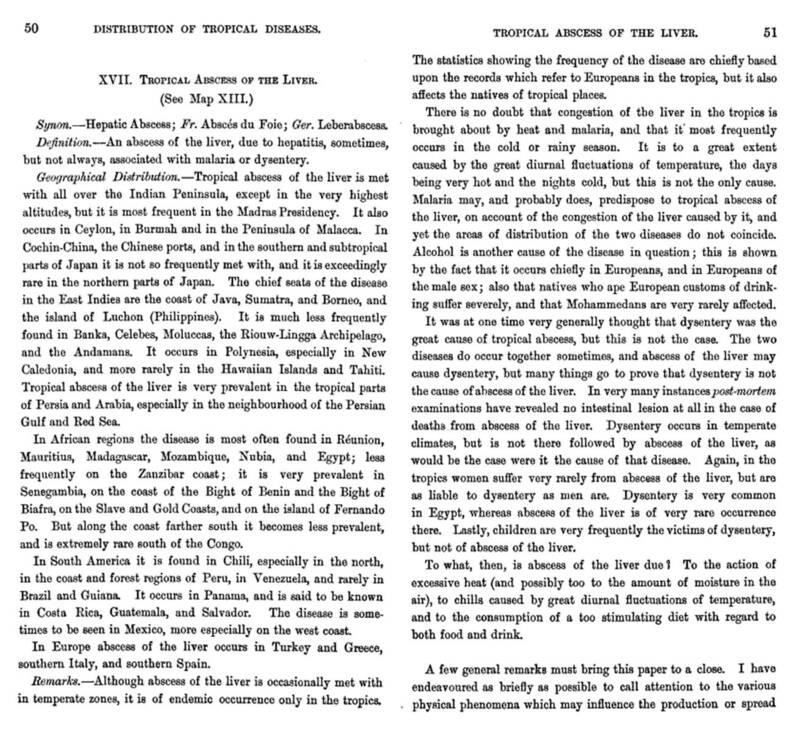 This section presents the philosophy on the origins and spread of Yellow Fever, mostly during its early stages–three origins are noted: a) West India, Greater Antilles, b) the Mexico border of the Gulf Coast, and c) the Guinea Coast, Sierra Leone, Africa. 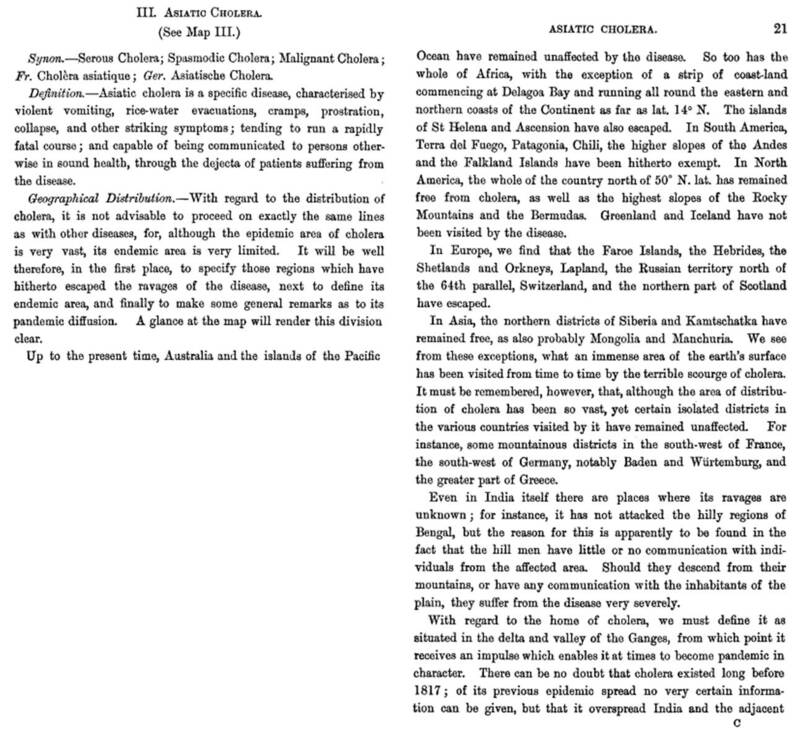 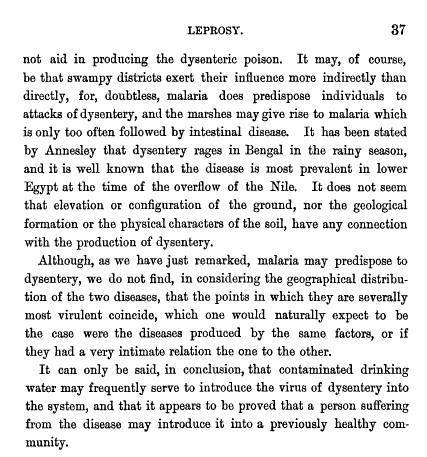 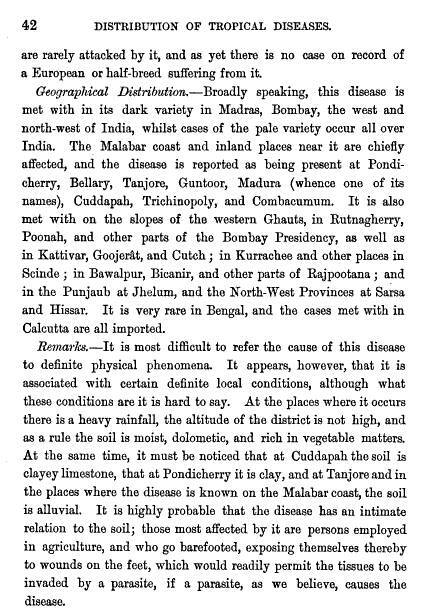 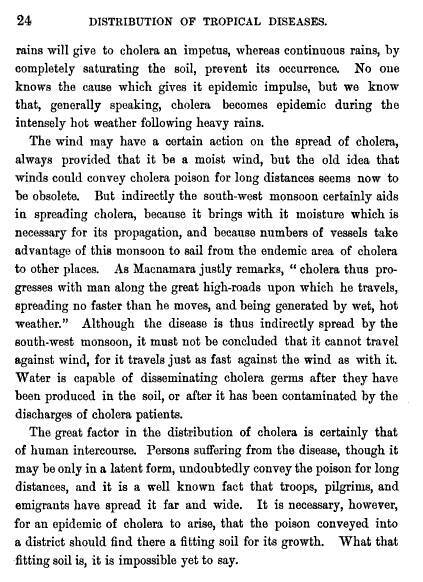 This disease was at times almost as pandemic in nature as Cholera. 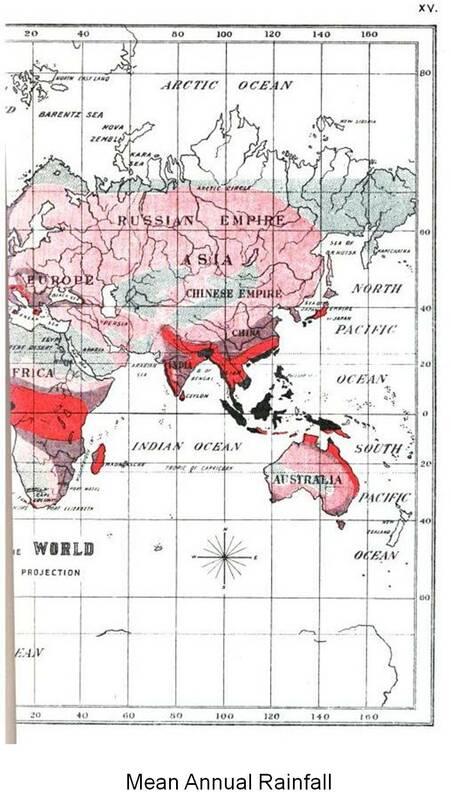 The darker areas are for Endemic Hematuria, aka Bilharzia or Schistosomiasis (see: a northern Black Sea port and west Nile delta and the Cape Colony ports in South Africa). 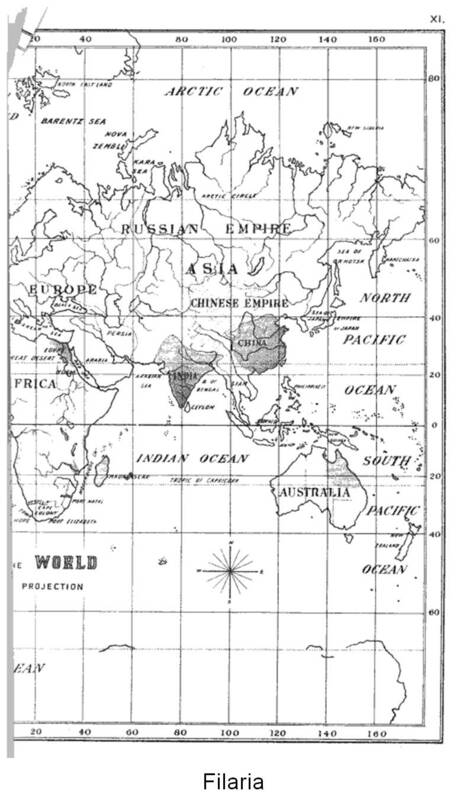 The very light grey regions over China depict Oriental boil (notice as well its diffusion through India into the Middle East where it is called the Budapest boil). 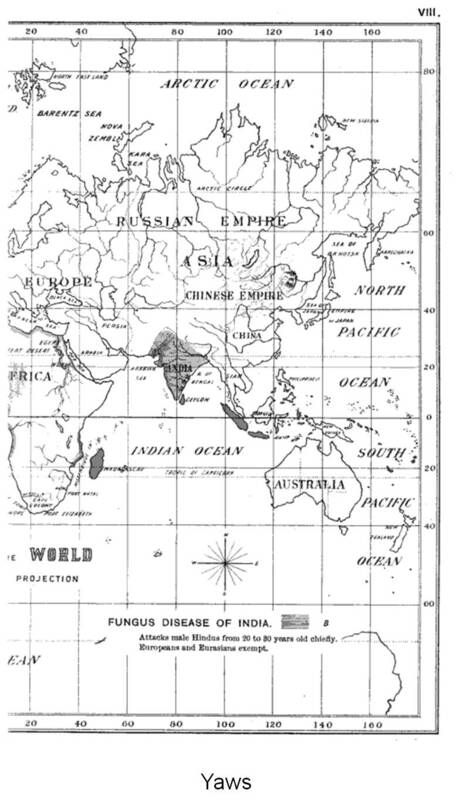 Notes: Yaws (darkest areas), the Fungal Disease of India (Madura Foot) and Elephantiasis are depicted on this map.